As I´ve told you before, part of the second MAPP semester is focused on exposing ourselves to different forms of the humanities and art. To this effect, we went on a field trip to the Barnes Foundation in Philly last Friday. It´s an educational institution that is centered around a collection of (mostly) modern art (displaying more that 2,500 objects, among them +800 paintings estimated at $25 billion; lots of paintings by Renoir, Cézanne, Matisse, Picasso, Monet, and many others). The founder, Albert C. Barnes, had a very special take on art. Instead of displaying each work of art on its own (or in it´s own right), he commanded they be displayed in what he called ensembles, arrangements of several paintings, oftentimes covering the entire wall of a room. Additionally, he mixes paintings with pieces of African art, or masterfully crafted everyday objects, such as door handles, large keys, and candlesticks. What is more, there are pieces of classical furniture (mostly chairs) beneath a lot the paintings, giving the whole exhibition the intimate touch of being in someone´s living room(s). Another important difference compared to traditional museums is a distinct “lack of explanation”. You´ll find the painter´s name on a little metal plate on each picture, but otherwise, there are no displays and no booklets helping the visitor to interpret or understand the paintings. Barnes wanted the visitor to find his/her own approach to the paintings. I’m not a “museum guy” at all, having rarely visited one after those inevitable 8th grade field trips. As such, I wasn’t particularly looking forward to this part of the class. And at first, my precautions were confirmed: the Barnes collection can really be overpowering. There are so many pictures in so little space that it’s hard to focus. I also felt that all this outstanding works of art would somehow be “wasted on me” because of my lack of education in these matters. Fortunately, our professor, James Pawelski, had us complete a special task: we were to pick one piece of art that we felt particularly drawn to – and stay with and behold that painting for at least half an hour. Its name is “Unpleasant Surprise” (Mauvaise surprise) and was painted in 1901 by Frenchman Henri Rousseau (whom, quite frankly speaking, I had never heard before…). 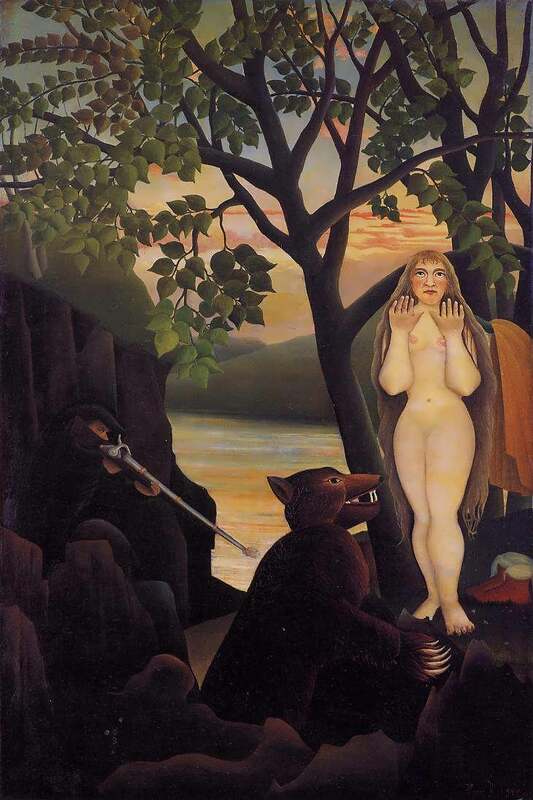 Now, when you look up interpretations on that painting, most will tell you that the guy on the left is shooting the bear to rescue the naked woman on the right. Additionally, it is inferred that the woman does not really feel threatened by the bear; and that therefore, the man really is the “unpleasant surprise”, depicting man’s growing estrangement from nature as a downside of the increasing use of technology (as signified by the gun). While I agree to some extent with that interpretation, here I´d like to share with you my own take on that painting – what came out of “wrestling” with it (that´s what it felt like…). The Fear of Embracing our Divine Nature? The first thing that struck me upon investigating the scene: to me, it does not really look like the man is shooting the bear at all. It may be hard to see from the picture on the screen – but when you´re standing right in front of the actual painting, it has a more three-dimensional quality. And that gave me the impression the man is really shooting past the bear, right into the ground in front of the women´s feet – as kind of warning shot to keep her from coming closer. Looking at the overall composition, there´s a clear bisection between the earthly colored left/lower part of the painting including the man and the lower part of the bear, and the colorful right/upper part including the woman, the upper part of the bear, and the lake scenery in the background. The shape of the woman is larger than that of the bear and especially that of the man. While the bear displays long claws and jaws, he does not seem to be particularly dangerous. He rather appears to be an oversized teddy bear that is craving to petted. And even though the man carries a large rifle, he is almost dwarfed by the sheer size of the woman. Looking specifically at the woman, she may activate a Venus or Eve archetype (the end of the right strand of hair even resembles a snake´s head), being naked and sporting the long hair. Obviously, she has just emerged from the paradisiac lake in the background. She´s staring heavenwards, raising her hands in a kind of “hand´s up” gesture. But it could very well also be alluding to the way priests hold up their hands when blessing the congregation. Putting all these clues together (size, pureness, connection to paradise and the heavenly sphere) I figured she symbolizes the divine and numinous part of human nature. What´s notable in addition: despite the beauty of her body, the distinctly female shape of her contour, her face clearly a masculine touch. Her facial expression could be anything from being sad, disappointed, or maybe unnerved – but she is definitely not scared. Looking specifically at the man, the most striking feature is that he´s really eyeing the woman when firing the rifle, not the bear. To me, that´s another strong indication for the notion that he´s not shooting at the bear at all. Otherwise, he´s barely visible, blending in with the earthly background. He´s small, earth-bound, and appears to be somewhat frail, thereby signifying the fleshly part of human nature. Now, the bear seems to be the connecting piece between those two realms. In his rising motion, he tries to escape from the earthly sphere, lifting his upper part into the heavenly domain, eying the woman with (what to me seems to be) an admiring gaze. In mythology, the bear is often depicted as a protector, teacher, and also as a powerful agent of healing. Additionally, he is metaphor for the reconnection with (one´s?) nature. Overall, the painting is a composition of (more or less) obvious opposites. The “goddess” has a female body but a masculine face. The man is a weak figure but carries a tremendously dangerous rifle. The bear is supposed to be fierce but looks like a plaything at the end of the day. And finally, there´s the divide in the landscape. I´m going to stop at this point. I feel I´m 80% there. But then, it feels like something constantly escapes my attention and that prevents me from grasping the picture to the fullest. Very interesting. I´m going to come back here once in a while over the next days to look at the picture. Very likely it still has got something (more) to tell me – otherwise, it wouldn´t have picked me (that´s what it felt like…) to stay with it. Now, has exposing myself to art enhanced my well-being? I´m not sure yet. And I fear I´m still not a museum guy. But for what it´s worth: it has been a powerful lesson on the effect of mindfulness. Without the explicit instruction to stay with one picture I clearly would have missed all the nuanced perceptions I tried to convey in this text.